I got quite a surprise when I opened the door the other day. 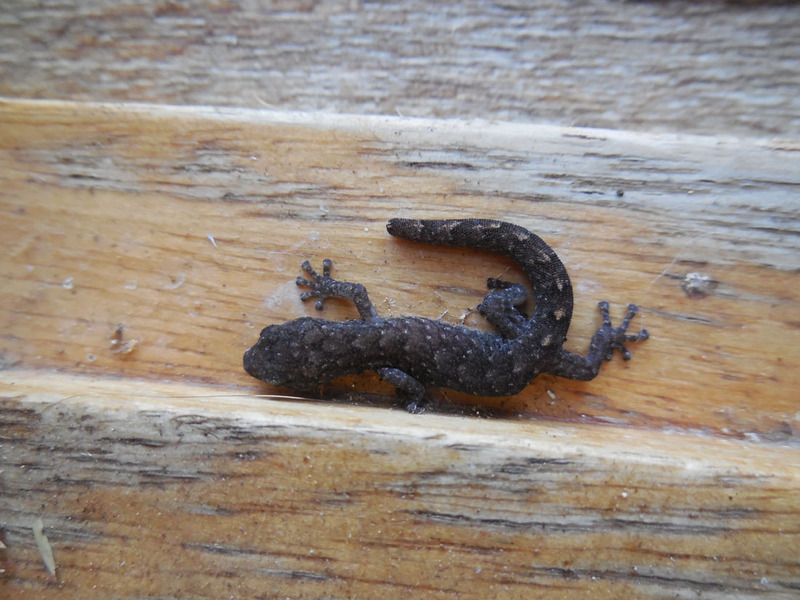 Sitting under the door frame was a small lizard – a Marbled Gecko (Christinus marmoratus). We have seen these attractive small animals once or twice around the garden but never so up close and personal. Even better it was back again today. Now we are keeping an eye out to ensure it comes to no harm. 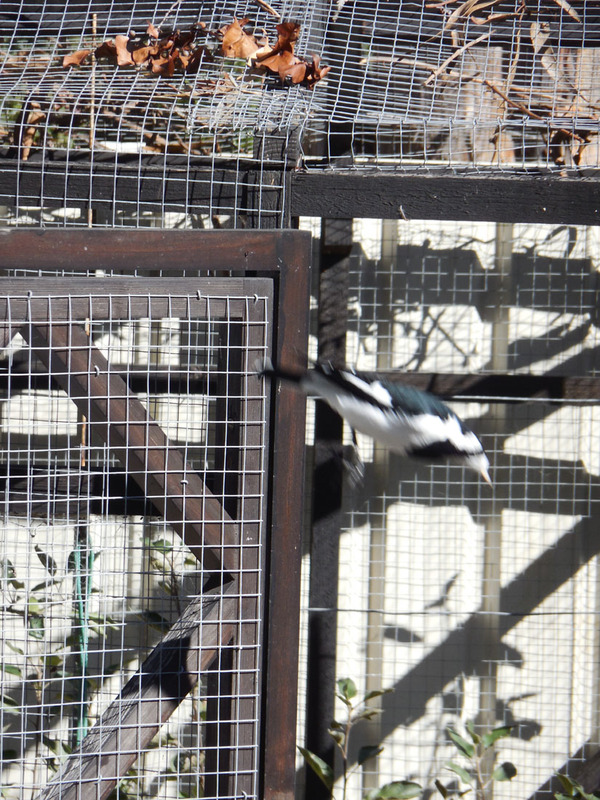 Not quite so welcome, but something we will just have to put up with are our local Peewees (Magpie Larks). They have finally worked out that they can get a share of the seeds in the chicken pen as long as they are prepared to pop in while the chickens are foraging in the garden. A quick dive into the chicken pen while the girls are out and about! Here are a few quick photos to update you on progress in the front garden. Since my previous post all the plants I had available were planted and two flat stones have been placed so we can now get to our letterbox. The sticks mark the new plants. I decided I needed larger markers so I didn’t inadvertently crush the small plants. Although the plants are small now when planted as tubestock they will have a much better chance of adapting to and growing well in their new home. Some larger plants have also been added. The main ones are correas, that produce lovely bell-shaped flowers that attract birds and bees into the winter garden. The current small display is an indicator of what we hope to see a lot more of in future years. 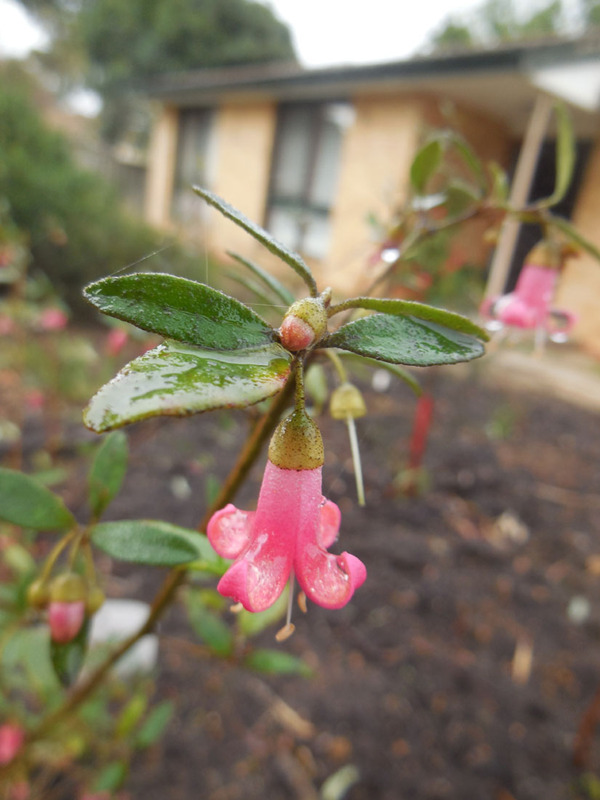 Correa ‘Winter Belle’ is an upright, autumn/winter flowering shrub that produces these mid-pink bells that recurve as the flower matures. We have planted these in a loose line along the side of the garden closest to the road to create a slightly taller background to the rest of the garden. 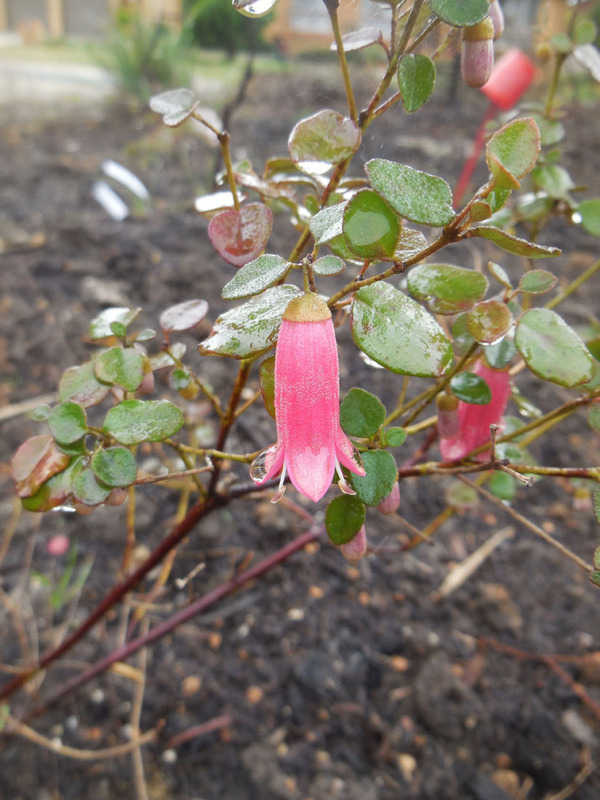 Correa ‘Pink Carpet’, which as you may guess is a more prostrate plant, has slightly longer bells than C. ‘Winter Belle’. 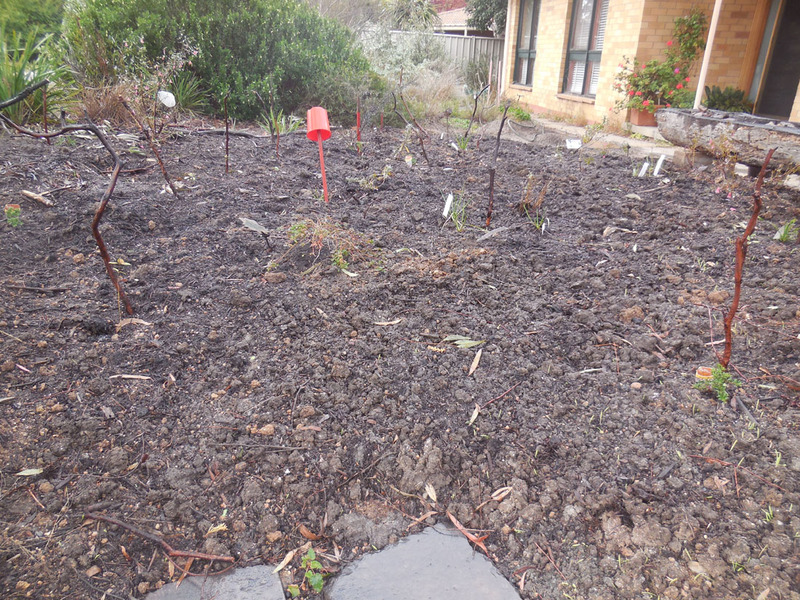 We have scattered the few plants we have in the mid-ground of the garden. I’ve had less success in striking cuttings from this plant than I’ve had striking cuttings from ‘Winter Belle’, but I have another batch underway and hope to produce a few more plants to include as the garden develops. 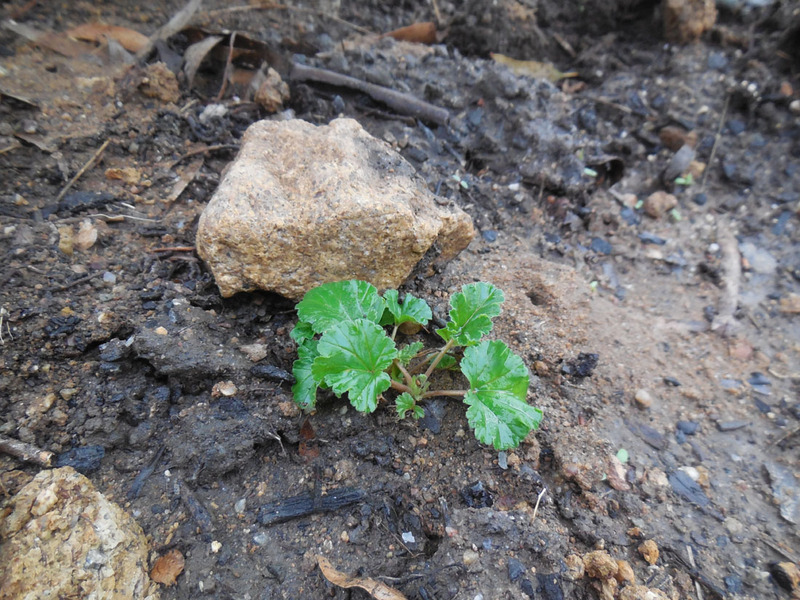 One other plant which grows readily in our garden is the Australian pelargonium, Pelargonium rodneyanum. It spreads by swollen tubers, at a pace that allows you to keep the plant in check, but also promotes easy propagation. At present I’m planting these as a low cover around the large rocks and in some awkward areas where it would be hard to get other plants to grow. It’s flower is an amazing deep hot pink. On Saturday I’m collecting my next batch of seedlings from a local Australian plant specialist. So the week ahead promises to hold a lot more work!